Paying attention is at the core of mindfulness. It’s a skill that many children haven’t yet developed, especially as it relates to how they feel, what they’re thinking, and what others might be thinking of them. When your child is paying attention fully to what’s happening in the now, she cannot be caught in the past or worried about the future. She is in the present moment without getting stuck in mental loops about what just happened or what’s going to happen. Being in the present moment, where all your child’s power exists, helps her to overcome whatever emotion is happening and let it come as well as go. Last but not least, Kabat-Zinn emphasizes accepting what is, or seeing things as they are without judging them or labeling them as good or bad. Your son may have gotten a poor grade on his progress report and may be feeling sad about it. This sadness isn’t good or bad—it just is. Being with the sadness without judgment and accepting it for what it is—a natural and healthy emotion—is mindfulness. 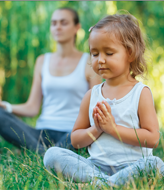 Of course, your child can decide to do or think something different to feel better, but mindfulness allows him to see what’s happening without making a judgment about it.